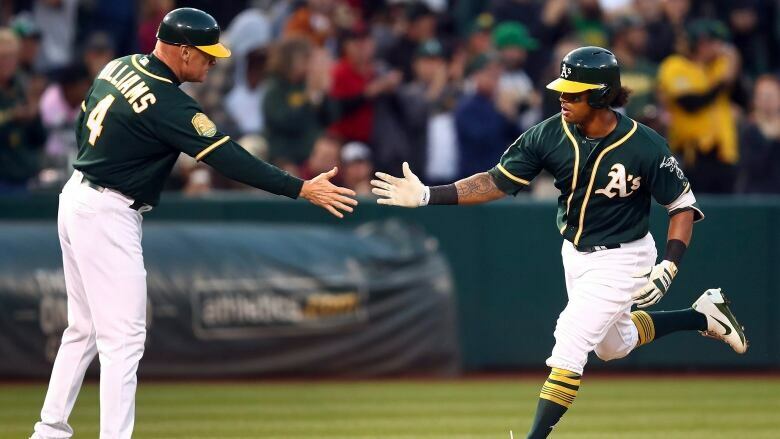 Khris Davis smacked his 29th home run among three hits Tuesday night, powering the Oakland Athletics to a 6-2 win over the visiting Toronto Blue Jays. Right-hander Trevor Cahill (3-2) limited the Blue Jays to two runs in six innings and the Oakland bullpen cleaned up with three innings of one-hit relief, helping the A's open an eight-game homestand with a second straight win. The Blue Jays scored in the top of the first against Cahill on a double by Randal Grichuk and an RBI single by Kendrys Morales, before Davis contributed a single to a two-run bottom of the first that gave the A's the lead for good. M​att Olson drove in the two runs with a bases-loaded single, scoring Nick Martini and Matt Chapman, who had opened the inning with consecutive walks off Blue Jays starter Sam Gaviglio (2-4). Davis' homer, his eighth in the last 10 games, led off a three-run third inning. Doubles by Olson and Mark Canha made it 4-1, before Canha stole home on the front end of a double-steal with Marcus Semien, who had singled. Gaviglio couldn't finish the inning. He left after 2 2/3 innings, charged with five runs on eight hits. He walked two and struck out two. Justin Smoak got Toronto within 5-2 in the fourth with a solo homer, his 17th of the season. But Oakland countered with its final run in the sixth when Chapman doubled and scored on Davis' third hit, an RBI single. The three-RBI game was Davis' 10th of the season, raising his season total to 84. Cahill allowed five hits in his six innings. He walked two and struck out six. Chapman scored twice, while Davis and Olson drove in two runs apiece for the A's, who had won six in a row before losing three straight in a series at Colorado that ended Sunday. Olson, Canha and Semien collected two hits apiece for Oakland. Morales had two hits for the Blue Jays, who have lost six straight to the A's this season by a margin of 43-15.